Hehe sorry I just had to do it again! In the UK we don’t use the term vacation – we use holiday instead! This continues on from the New York post. We flew in from New York and I got all excited as we flew I as I could see the circuit – it’s hard to miss with the weird golf ball thing that’s there! The couple sat behind us were also going to the Grand Prix. As we went in through Customs pretty much everyone was there for the Grand Prix! I was looking out for any celebs but alas none were around! We got the bus from the airport to the hotel which was the Holiday Inn in Chinatown. When I booked it I had no idea it was in Chinatown but me being a fan of chinese cuisine thought it was great! 😀 Naturally we had chinese for food that evening! It wasn’t great to be honest and I was feeling quite ill after it. 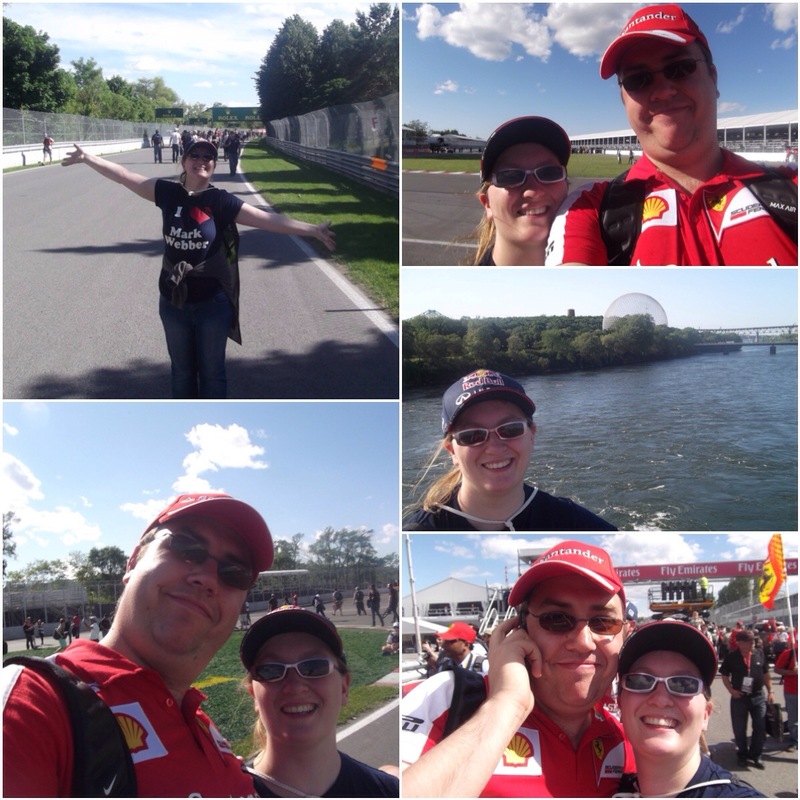 We then headed down to the Metro (station was opposite) and found our way to the circuit – only one change which was great! We couldn’t get onto the circuit itself as the security guards blocked our way! The circuit was holding an “open house day” where fans could visit the track, walk down the pit lane and if lucky get to meet some drivers. As we arrived at the pit lane there was a lot of people hanging around under the podium and we went to see what was going on. 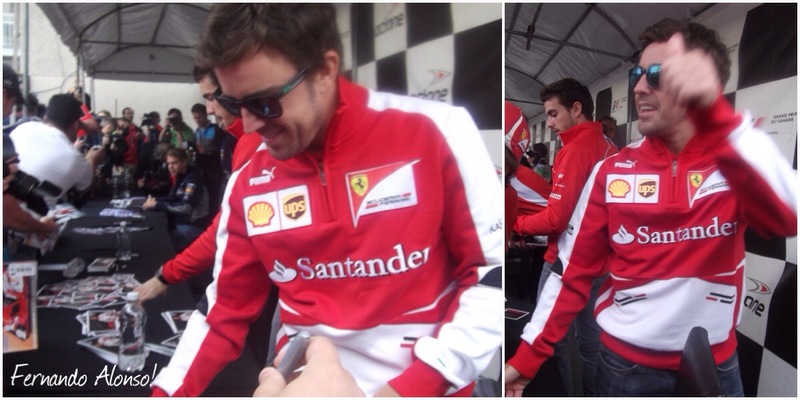 We quickly realised that it was the driver autograph session! You had to queue to get to the drivers and they would only stay out for about 5mins at a time. 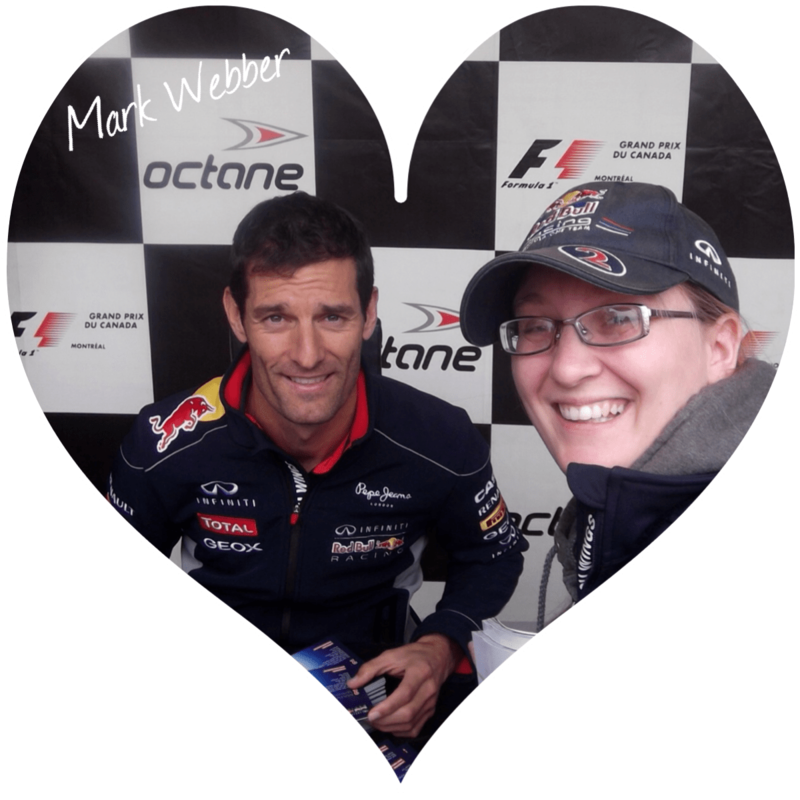 Now of course I really really wanted to see Mark Webber since it was his last F1 season. I got in the queue hoping I wouldn’t miss him. As I got towards the table there was still no sign of him so I managed to get myself “stuck” by the entrance and stayed there until I saw him. This worked well for us as we managed to get autographs of quite a few drivers. Bianchi gets an extra big photo after his crash in the Japanese GP yesterday. I hope he’s ok! So hubby got to see his man Alonso! Unfortunately he was just leaving as we got to the table but we managed to get him to sign our programme and got these two photos of him. Next up was the Mercedes drivers of Hamilton and Rosberg and the third was Red Bull’s Sebastien Vettel. No sign of Mark Webber. Which didn’t exactly surprise me since tensions between Webber and Vettel were high at the time. Anyway after everyone else had been Mark came out – he was the very last one! And SO worth the wait! 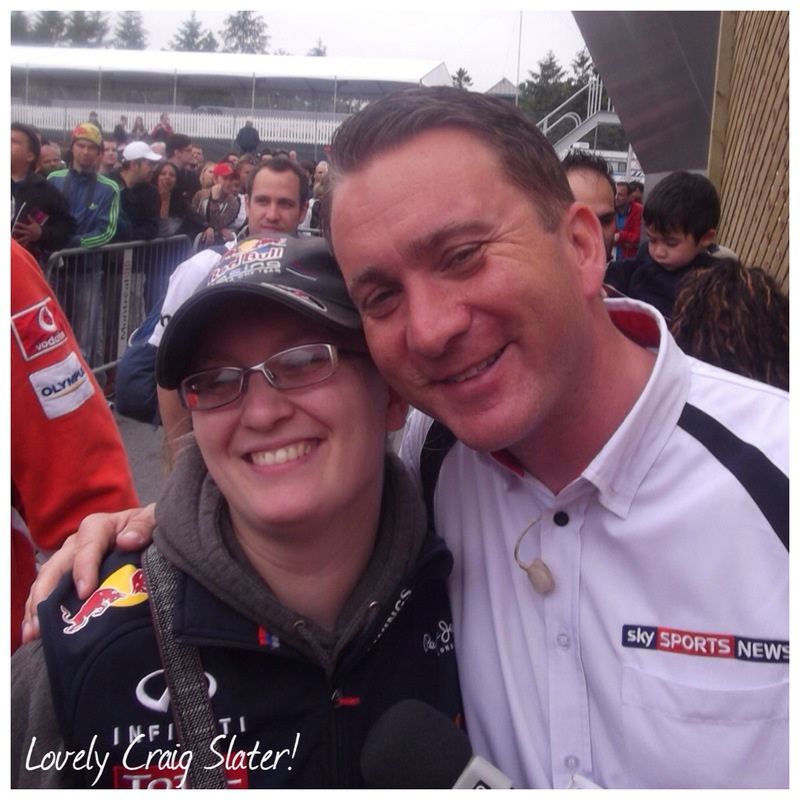 When I went up to him I was wearing my Red Bull gillet and was just wishing him all the best for the race when my hubby said to him… “Eh Mark! Wanna see what she’s wearing under that? 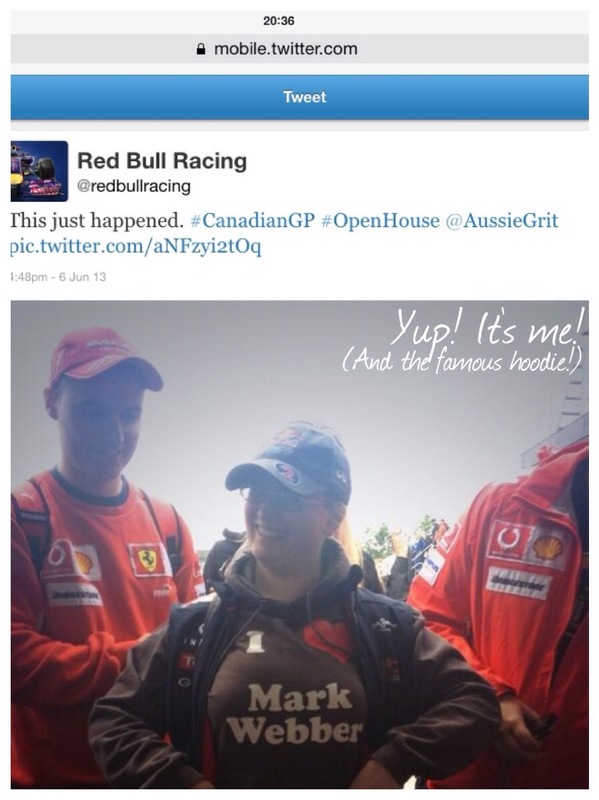 !” The frightened look on Mark’s face says it all but it was only my Mark Webber hoodie. His press girls saw it and then this happened! Hahaha! His press girls did ask if they could take a photo before doing this! I had a nice chat with them and asked if I could have a Webber hug. Unfortunately security moved me on! But not before I had some photos!! 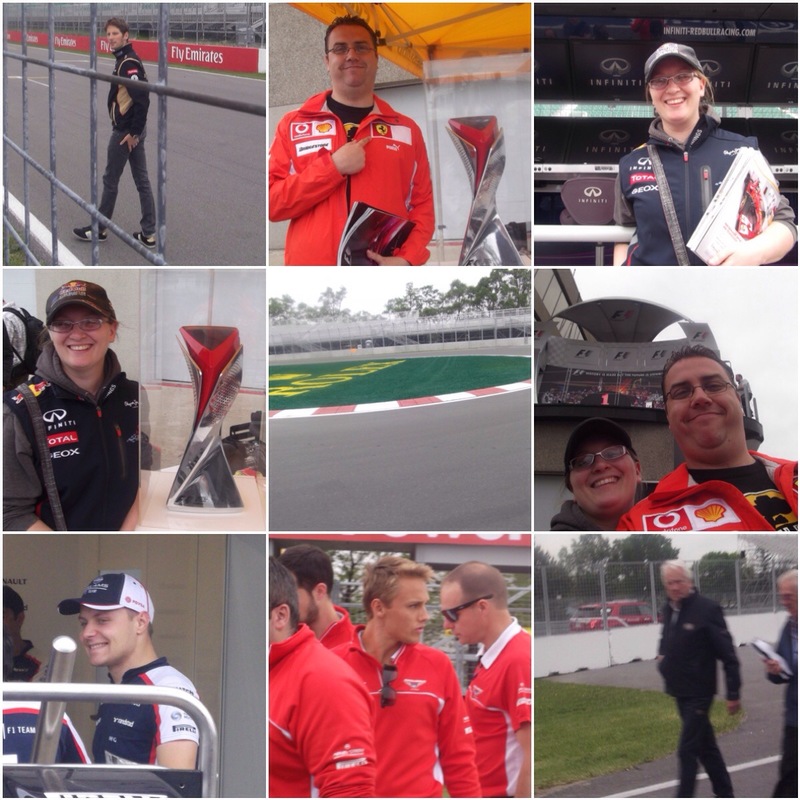 After the hug with Craig we pottered down the pit lane and saw the garages, the pit wall boxes and even the trophy! We saw Bottas at the Williams garage and Grosjean walked through the crowd to get to the track. After this we went back on the bus to exit the circuit. On the bus I spotted Max Chilton and Charlie Whiting! We headed back to the hotel and after a nap we headed out to find food and find where the Hilton was. We found the Hilton and went for a meal in the restaurant next door. Hubby had a burger which was huge! Afterwards we sat in a window seat at the Hilton’s bar. I was equipped with camera, paper and pen ready to pounce on any team members I recognised! 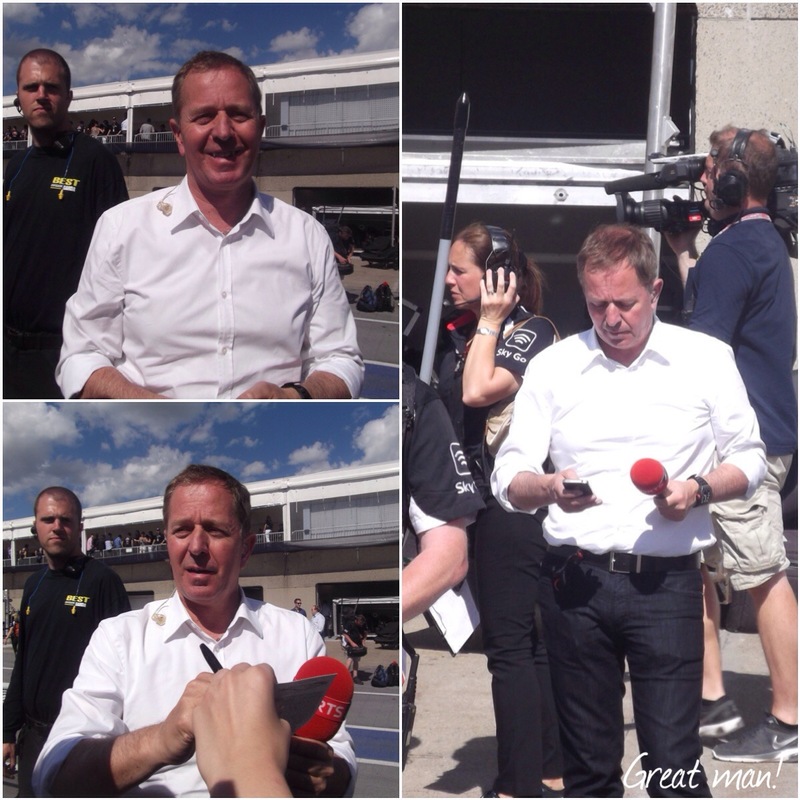 First of all I saw Crofty – Sky F1 Commentator! We had a nice long chat with him! He is lovely!! Then we saw Simon Lazenby (Sky F1 Presenter), Ted Kravitz (Sky F1 Pit Reporter), and Johnny Herbert (former F1 driver and now Sky F1 presenter). Had a photo and autographs so I was a happy bunny!! Wow so we had an eventful Thursday! But still we had to be up early on Friday so we could make our way down to the circuit for the Practice Sessions. It rained on Friday and Saturday so it wasn’t very memorable. 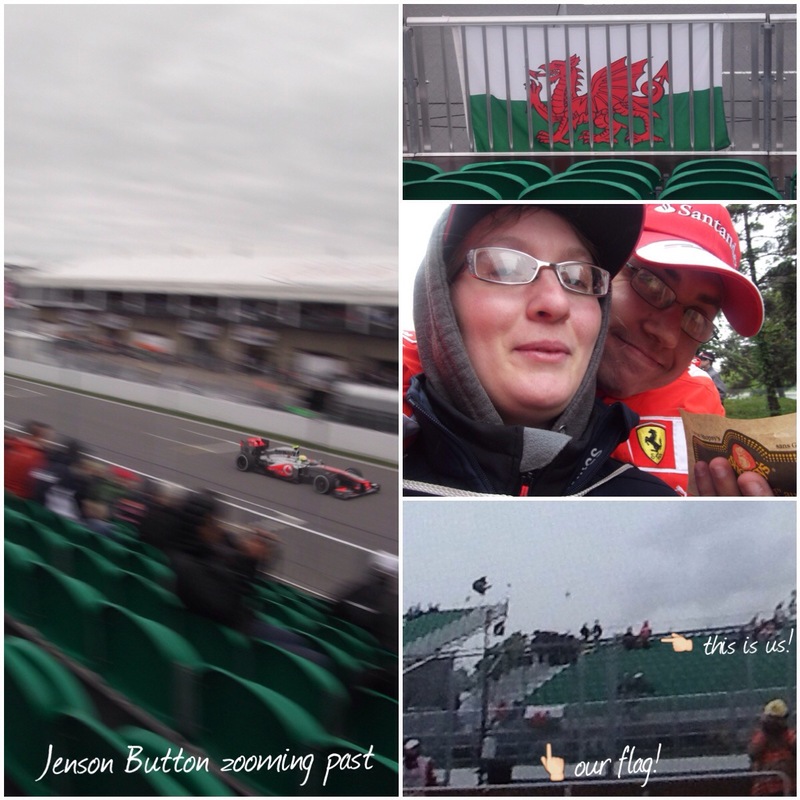 The memorable moments were us being told off for tying our Welsh flag on the front of the grandstand (we spotted us on the Sky coverage), the fact that we were given two hot dogs for the price of one, the fact that I felt ill after said freebie hot dog and Bottas qualified 3rd in a Williams! On Saturday evening we went into the city centre and saw some festivities. We didn’t stick around for too long though. We found a Games Workshop (hubby wants to visit every shop he can!) and found a great little shop selling gaming merchandise. Hubby couldn’t resist buying a red Yoshi and a Luigi doll. Honestly he’s a big kid! 9th June – Race Day! After the rain of the previous two days it was nice to see the sun on race day! Although it would make it a bit of a boring race! 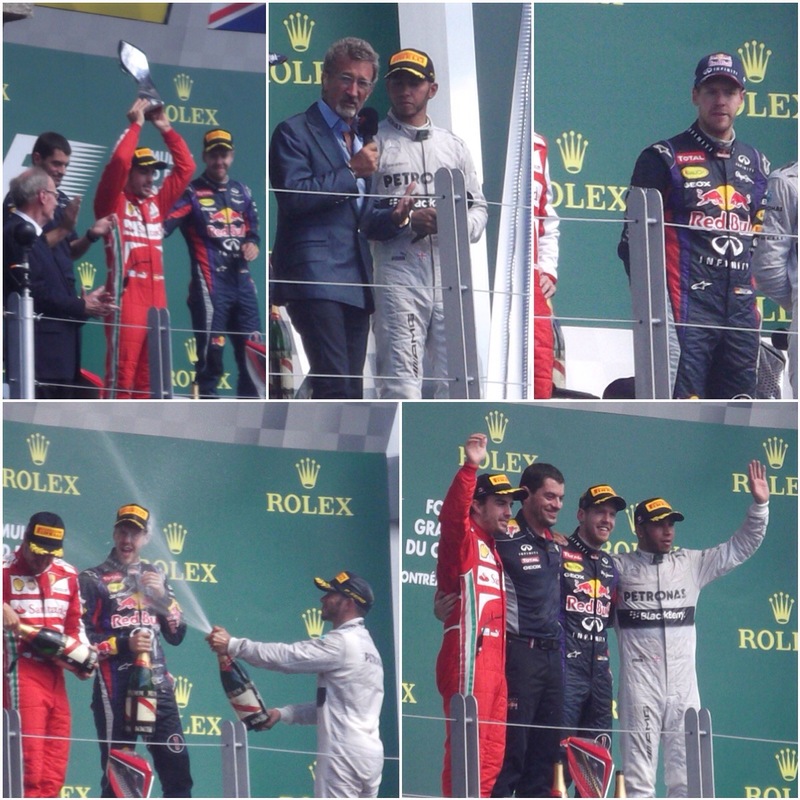 Vettel won the race, Alonso came second and Hamilton third. Webber finished in 4th place – he may have ended up on the podium had it not been for a crash between him and Guido Van de Garde. Shame! After the race we ran to the next grandstand and jumped through the fence to get onto the track. 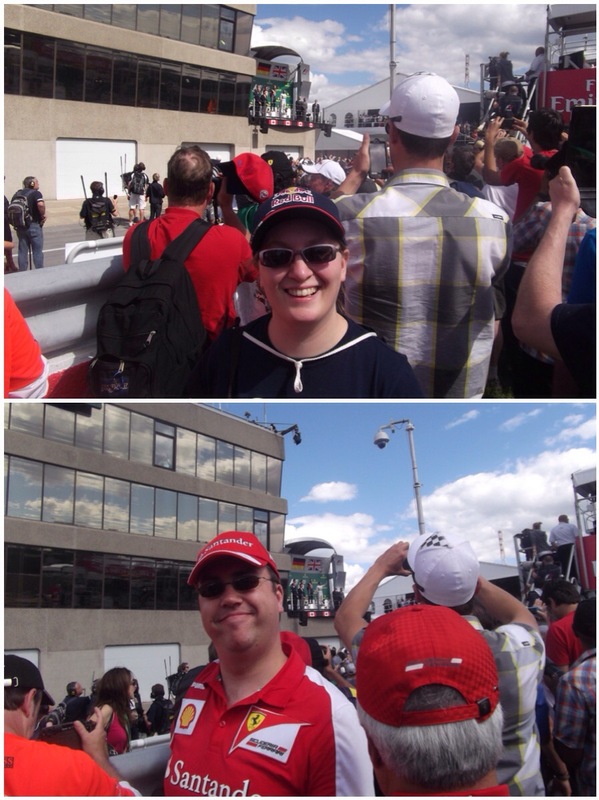 We then ran up the pit straight to stand as close as we could to the podium. We didn’t manage to get under the podium but had a good view from where we were stood. We spotted a few other F1 celebs floating around including the late great John Button. But the absolute best spot was Martin Brundle (Sky F1 commentator and former F1 driver). He was standing around playing with his phone when I spotted him. Me being me shouted “Eh Brundle! Quit Tweeting and get over here! !” And he did! He came over for a chat and signed autographs for the crowd. Needless to say I was thanked by all for shouting!! Hehe! We then walked around the track (back to front I might add!). We walked the whole 2.7miles (4.3km) of it! And as you can see I was extremely happy to have walked it all! Whilst walking around hubby got a phone call from his parents to say they’d seen is on the Sky F1 coverage! Ahhhh we’re famous! Teeheehee! I think you can pretty much guess from the photos and the length of this post that we had a fantastic time! And imagine, I didn’t post all my photos! Let me tell you this, I was going to do it ALL because did I mention, I was 3 month pregnant doing all of this! How about you? What was your best/worst vacation/holiday? Oh my gosh what a fun trip! Looks like you guys squeezed in SO much and had a great time!!! I’d love to go to Montreal! It was a fantastic trip! And yes we packed in as much as we can because we knew it was going to be our last BIG trip. I was 3 months pregnant at the time so knew we wouldn’t be doing any long haul F1 trips for a couple of years. The weird thing is that we weren’t too impressed with Montreal. But I think to be fair we didn’t really give it time since we spent most of our time at the circuit. Ahh well if you’re going to be reading my blog you will soon learn about the F1!! 😉 And yeah we had an awesome time! I loved reading your post. I was wondering what happens at a F1 weekend. It looks so exciting!! Thanks for stopping by! 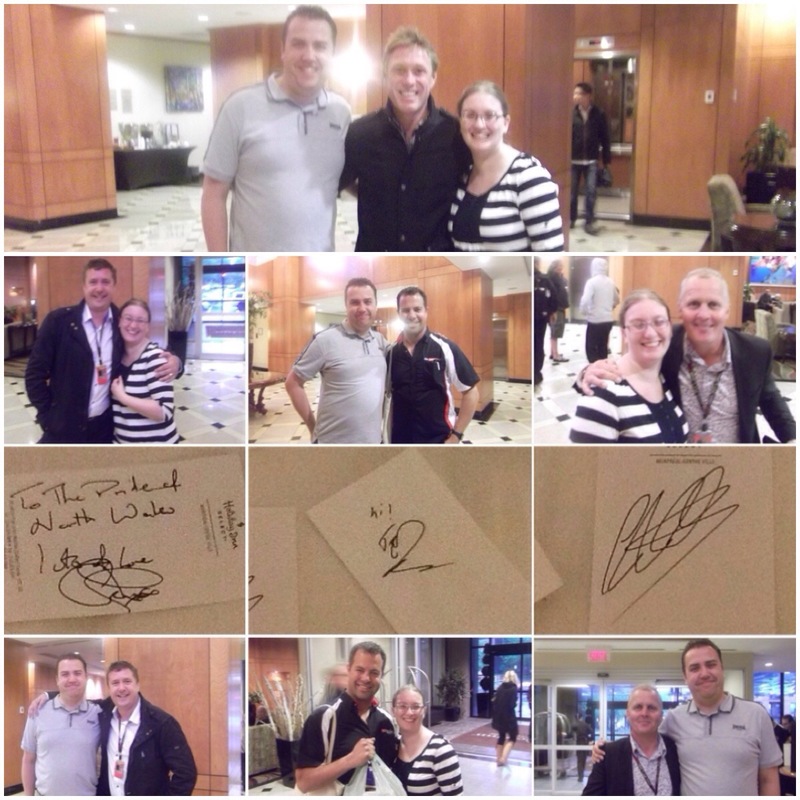 I’m glad you liked the post… an F1 weekend is just awesome! 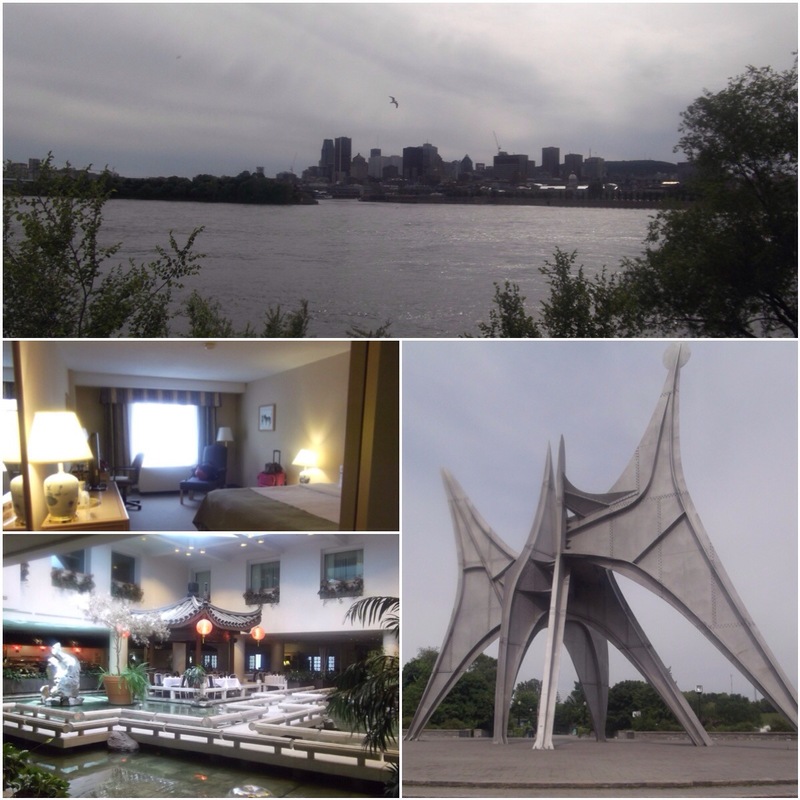 There’s so much more to see that what I’ve mentioned here though – there’s the Fan Village and in Montreal there’s lots of festivities (although we got lost and missed it all! ).